The art of knife throwing has been around for thousands of years. The origin is unknown. 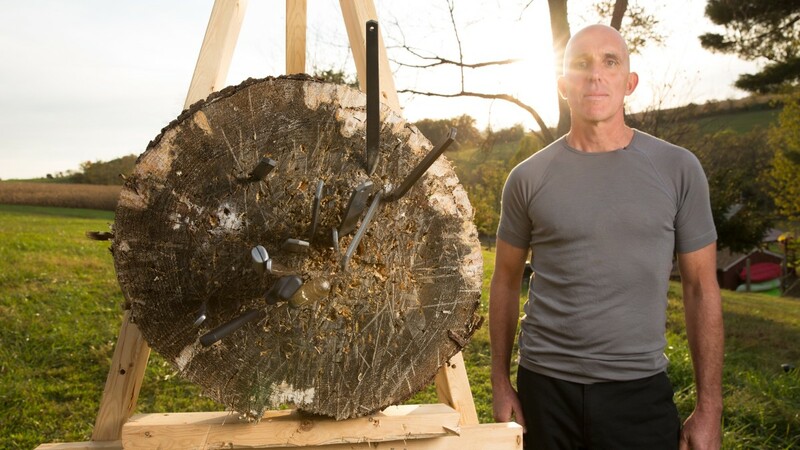 From circus performances to knife throwing competitions to survival and self-defense skills, learning how to throw a throwing knife�has endured the ages as a popular entertainment and survival method. Throwing knives are typically categorized by their weight. Some knives are blade-weighted, some are heavier in the handle, and some are balanced evenly. Before you get started, you need to find or make a target. Most people use some kind of wood as their target. I recommend using a softwood like Pine, Poplar, or Cottonwood. This helps lodge your knife into the wood a little more easily than if you were using a hardwood like Oak. Also, avoid plywood for the same reasons. The larger the target – the better.�For beginners, it’s more important to master a proper throw than it is to hit your target accurately. If you can find a large section of log, that would be an ideal target. If not, you can use any spare wooden planks you have in your garage. If you don’t have either a log or any spare lumber, check with your local tree cutting service, firewood supplier or lumberyard. They typically have scraps they may be willing to give away or sell at a very discounted rate. You can also ask family and friends. People chop down trees all the time, or may know someone who has recently chopped one down. If you’d rather purchase a throwing knife target, here’s my recommendation. Now that you’ve got a target, you need to carefully choose your desired throwing knife. When first learning�how to throw a throwing knife, I recommend you choose a throwing knife specifically for the task. You can learn to throw with any knife, or even make your own, but for beginner purposes I recommend purchasing a set of throwing knives. Choose a dull knife with a pointy tip. This is to prevent injury to yourself during practice. You only need a pointy tip to make sure it sticks in the target.�If you were to handle a sharp-edged blade over and over, you are greatly increasing the possibly for injury. In the case of knife bounce back, you also only have one point of injury contact instead of any entire side. 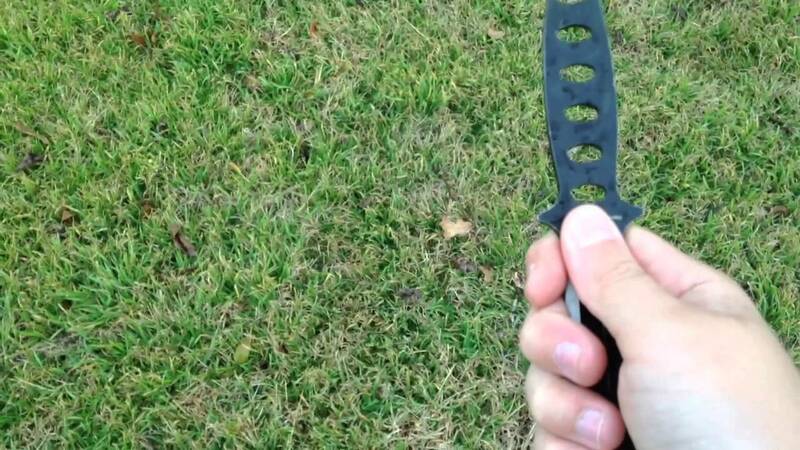 The best throwing�knife don’t require a fancy handle. Most knife throwing experts prefer handle-less all steel blades because they�don’t require upkeep later on, and you won’t have to worry about repairing a broken handle. Choose a throwing knife that weighs around 200g with a simple design. The simpler the knife, the easier and more accurately your throws will be. The lighter the throwing knife, the more it becomes mid-flight. However, you don’t want too heavy of a knife either, or a knife with too many perforations or cutouts in the design. Knives with minimal holes are recommended to prevent breakage from repetitive throws. The ideal beginner throwing knife is�200 grams, and be 7-10 inches in length. You should be able to find a pretty large assortment of throwing knives at a local gun and knife shop. If you can’t find anything, or want to read some reviews beforehand,�Amazon has a great selection available. Before you begin learning how to throw a throwing knife, there’s a couple things you�first need to do: Create a goal, and take safety precautions. The goal of knife throwing is different depending on your skill level. Create a goal, research what you need to achieve that goal, and then practice to reach that goal. Safety measures you should take. Most of these are�answered in this article, so you shouldn’t need to do any further research unless you really want to. When handling a knife, always use caution. Use common sense when handling throwing knives and you should be okay. Be sure to read through this list, there’s a few additional safety precautions you should take. Don’t practice barefoot. Use closed-toed shoes, not sandals. Notify people in the vicinity of what you are doing. Practice away from pets and family members. Practice away from buildings, windows, and propane grills. The last thing you want to do is�injure your dog or kids by not alerting them of what you are doing. Now that you have your goals, expectations, and safety precautions in order, it’s time to get started. As with all sports, proper form is essential in mastering the art. Pay close attention your posture and footing. Learning these two correctly from the get go will ensure you form good throwing habits from the very beginning. Relax your body. Just like your baseball coach taught at bat.�If you are too tense, you might overthrow or have inconsistent throws. Stand straight up. Improves accuracy. Foot Placement. For right-handers, place your right foot forward and your left foot slightly further back. When learning how to throw a throwing knife, proper hand placement on the knife is key.�There are a few different methods to hold the knife, so be sure to read through each and determine which grip best suits you. Stand straight up comfortably, with your leading foot in line with your throwing hand, and be relaxed. Now, determine which end of the knife is the heaviest. This is the end you will be holding in your hand. Once you do that, try out these different knife grip techniques. This is one of the easiest full-turn grips to learn. Hold the knife horizontally, and grip it like you would a hammer. Place your thumb on the center of the side. This grip is best used for lighter�blades. Pinch the tip of the knife blade between your thumb and the second knuckle of your index finger. The rest of your hand should form a fist. Hold your knife vertically. Grip it with your whole hand just like the Hammer Grip, but rest your thumb on the edge. This grip is used if your blade DOES have a sharp edge. It’s best to use dull blades with a pointy tip, however, experts are adept at using any knife and opt to use this method. Ensuring the sharpened edge is away from you, and hold the blade against your palm. Your thumb will extend on one side, and three fingers on the other. Please exercise caution when attempting each of these throws.�Changing your grip can have unexpected results for the first few attempts. After a while of practicing, you should be able to “read” the knives fairly well. Part of learning how to throw a throwing knife is experimentation. Whether that means using different blades of varying weight, adjusting your stance, or stepping a foot or two closer, you should become more comfortable over time. Point Up: Means you are throwing too fast or are standing too close to the target. Point Down: Means you are throwing too slow, or too far away from the target. If the knife isn’t embedded into your target straight (meaning not in line with the vertical grain of your wooden target), then you are rotating your wrist as you release. Grip your knife a little more to counter this. This is one of the most popular knife throws, which is why I’m covering it first. You should learn this one first before attempting any of the other spins. Once you master the half-spin throw, you are one step closer to attempting more advanced throws. This method performs a�half-spin mid-air between you and your target, hence the name. You will be using the Hammer Grip throw for this. Remember: You can always adjust your distance to until you find your sweet spot. Stand 6 feet away from your target. Take a deep breath, relax, and square your shoulder up with your target. Grip your knife firmly with the handle towards the sky, and�raise it to eye level. Pretend you are about to hammer a nail in�the invisible wall in front of you. Reach back slightly, and throw your knife with moderate force behind it. Release when the blade it in front of you. No need to throw as hard as you can. Follow through like you would a baseball. If you�were able to lodge your knife into the wood, congratulations! You have just landed your first successful throw. After you get the hand of this throw, try a few other knife throws. Since this guide is geared towards those just starting out, I won’t go into as much detail for the advanced throws. If you’re looking for an in-depth resource for advanced techniques, I recommend�The Complete Knife Throwing Guide by Gil Hibben. This technique is also known as the quarter spin technique. In order for this to work, you will half to step a few feet closer to your target, and adjust your grip. If you normally thrown at 10 feet, you’ll want to move in closer to 6 feet. This technique works best with a well-balanced knife. It is harder than the half spin throw, so try not to�get frustrated if it takes longer to learn. Get in your normal stance. Grip your knife handle between your thumb and middle finger. Rest you finger on the back edge of the blade. Curl the rest of your fingers naturally inward towards your palm. Raise your knife to eye level and point the tip towards the sky. Point your knife at your desired target a few times. Pull your arm back, step into your throw, and release when you are pointing at the target’s center. Since this throw is considered an “advanced” throw, it should be attempted only after you can consistently sink the tip of the knife into the target. To begin this throw, you want to be standing at the optimal distance. Since you stood 6 feet away for the half-spin throw, for the one-spin throw you should do double your distance: 12 feet. Take your arm length into consideration when measuring distance. Back up an additional 3-4 feet for this one. Following the same procedure, give it a few attempts. Raise your knife tip to the sky, draw back, and release once you are pointing at the target. Throwing knives may seem like a plausible option for self defense, but should only be used as a last resort option. Part of learning how to throw a throwing knife is learning what situations they are best suited for. It should only be used if you are confident that you will hit your target. If you miss, you are giving away your location and giving your target a weapon to use against you. Also, never throw your last knife, even if you are confident you will hit your target. Hopefully you never find yourself in a survival situation with only a few throwing knives. But, it’s always better to prepared than to be without. Throwing knives are not the most ideal hunting weapon. 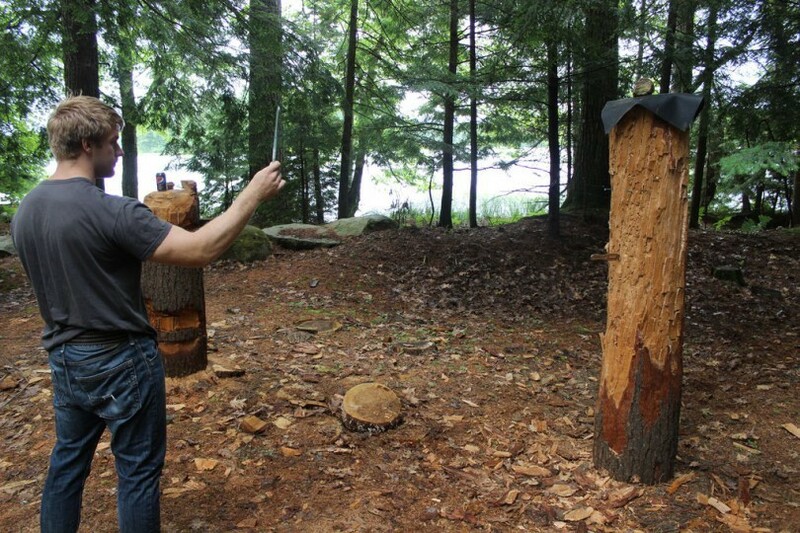 A primitive spear or atlatl�would be a much better option. However, if you find yourself in a wilderness survival situation with only your set of throwing knives, they can still be pretty useful. When choosing the best throwing knives, the difference between high-quality throwing knives and low quality ones are readily apparent. Low quality throwing knives are typically made of poor quality steel and are more prone to �scratches, dented tips, or knife breaks. The chances of missing a few throws are pretty high, so you should always purchase a throwing knife set that will last. Higher quality knives are typically made from a single sheet of stainless steel. This construction ensures that the knife in question will last forever, withstand thousands of throws, and perform perfectly when a situation arises. They should also have a sturdy tip, and a comfortable handle. The difference in price between a poor quality and high quality throwing knife is minimal. Therefore, do your due diligence and do some proper research on what�s to look for regarding knife quality. Here’s my recommendations for the best throwing knives. This set of 3 blades is a great option for someone looking for quality knives at a reasonable price. Gil Hibben has�a name synchronous with quality, and is also a well known author of several knife throwing books. These knives make an excellent practice set since they can be repeatedly thrown with ease and with minimal fatigue. If you like this knife, you can check it out on Amazon. This knife measures 12″ in total length(7″ inch blade). It’s also one of the highest-rated throwing knives on Amazon. It features a full-tang construction, with a normal grip and perfect weight balance. While not inherently meant for throwing knives, this knife has the weight and design of many higher-end throwing knives. If you like this knife, you can read more in-depth ratings here. This is the set of knives to choose if you are just starting out. They are constructed very well, heavy, and can persevere�through repetitive use (and misses). If you like this item, get it on Amazon here. Good luck! Stay tuned for a more in-depth guide on the best throwing knives on the market. I hope this guide helps you learn how to throw a throwing knife. Throwing of knife would be as old as the stone age as throwing of spears and other sharp objects made from stone are recorded. knife throwing could be a great avenue for fun. while growing up, it was fun throwing against the wooden wall of the old pig house. At the beginning it wasn’t as I didn’t quite grab the technique and I was forcing it. I remember getting the first one and subsequent throw keeps getting better. I would love to do it again soon, it been a while now.